Greenstuff Gretchin: 'Ere We Go, 'Ere We Go, 'Ere We Go! It's 2016 and I've been persuaded to start a blog about my miniatures sculpting and conversions. In 1995 I fell into the table top wargaming crowd at school and started collecting Warhammer 40K miniatures. My first army (and first love) was the space orks of that era, they were so wacky and incredibly unpredictable which I think is missing in their contemporary counterparts. "I don't get nice miniatures to play with, I have to make my own..."
My first attempts at sculpting were made from Milliput and were absolutely terrible, but I stuck with it long after I fell out of the hobby for several years. I still used to collect all the sourcebooks (especially the old ork ones from the Rogue Trader era) because I really enjoyed immersing myself in the world, but it wasn't until the millennium turned that I got back into gaming itself, but this time with smaller skirmish games like Inquisitor and Mordheim. Again, with life being what it is, I ended up moving further and further away from the hobby and even gave up sculpting for a few years. In 2013 I stumbled across something called INQ28 on the internet and was so utterly stunned by some of the sublime pieces that people were making that it drew me back into the universe of the forty-first millennium and inspired me to pick up my tools once again. So the runtherd at home has been poking me to start a blog and show off some of my stuff and maybe get some feedback. Despite my chosen avatar, I am shamefully bad at painting (or even getting around to painting) my miniatures, so expect more greenstuff nudes than anything fully completed, but I will get to them eventually. 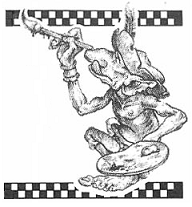 Speaking of my avatar, some older gamers may recognise it as one of Paul Bonner's gretchin, one of my favourite artists for greenskin artwork. 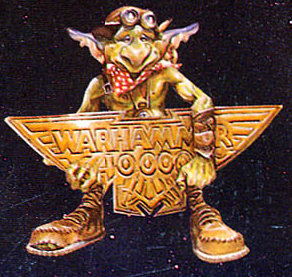 For me Paul Bonner just expertly captures the sheer wackiness of ork culture and warfare. But I digress, with a new year comes new projects and I'm looking forward to my future posts.